Sophie and I had a very long but fun day, we kept out the cold with hot chocolates and Christmas music and some exceptionally good biscuits to keep our energy levels up! Our felt tree decorations were definitely the biggest hit, closely followed by button pictures and cake pops. 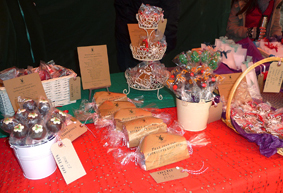 We are fully restocked to make sure no one misses out when we are back at the market tomorrow – Sunday 16th December. Please pop along and say hello, sample some of Becky’s tasty gingerbread and and maybe get yourself a few last minute Christmas presents! 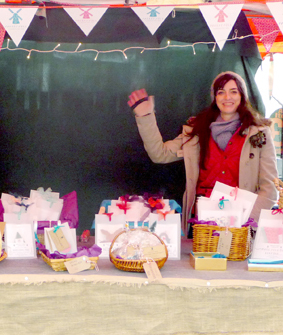 Hopefully see you tomorrow – 10 until 5 on the parade in Leamington Spa. Sophie looking cheerful and wrapped up against the cold! 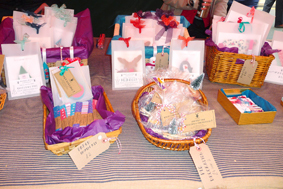 Decoration Kits, Paper Chains and Festive Pegs! 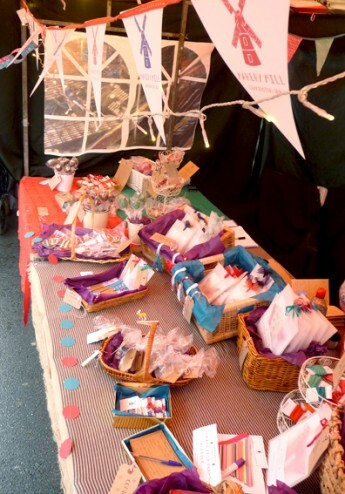 Cake Pop kits, Festive Cake Pops and gingerbread decorations….